Can you sync your Gantt charts to Outlook Calendar? Of course, you can! Actually, you can synchronize your Gantt charts with Outlook Calendar or Google Calendar. 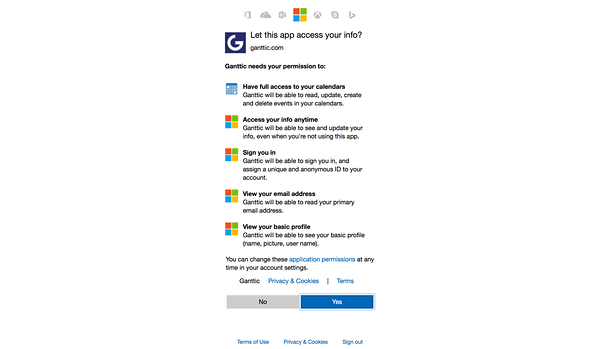 Use this feature to manage your team without making them actually sign in to Ganttic. Keep your staff members updated on the go or make all plans in one place through Outlook Calendar app. A new event will appear automatically in Ganttic when you create it in Outlook Calendar. Similarly, a new task will appear automatically in Outlook Calendar when you create it in Ganttic. The same goes for all changes made in events' title, time and date. This is the case for two-way sync. It's also possible to activate the one-way sync upon your choice (Ganttic > Outlook or Outlook < Ganttic). Compared to Google Calendar synchronization, there are no project title, task data fields and notes sync options. Only event titles, times and dates are synchronized. Meeting invitations that are added to Outlook as calendar entries are not synchronized. The sync feature only works with online Office 365 email/calendar accounts. MS Exchange support is currently disabled. The sync will be terminated upon Outlook password change. If you periodically have to change your Outlook password for security reasons then stop the sync prior to that and reactivate it. This opens the resource dialog. Click on 'Apply settings' and 'Start sync'. If you activate the two-way (Ganttic < > Outlook Calendar) sync then existing data from Outlook Calendar will be imported into Ganttic and vice versa. Choosing any of the two one-way options will result in importing existing data from Outlook Calendar to Ganttic or vice versa. With all sync directions imported existing past data is limited to 1 month period. However, this limitation is not applied to future items. Do do that, click 'Yes' in the form that pops up. Click on 'Start sync' once you have made the decision. Each resource that has an active sync will be marked with a green icon on the top left. To avoid data from Ganttic populating your personal or colleagues calendar and vice versa (for 2-way sync) it's advised you first create a new Outlook Calendar and then sync Ganttic's resource data to this one. 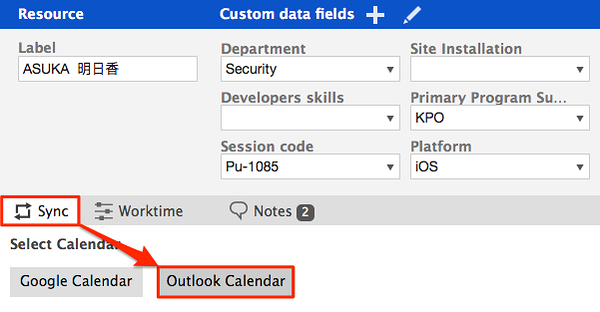 In Outlook you can choose which calendars data you want to view. Multiple calendars are allowed. Did not find the answer to your question regarding Outlook Calendar synchronization?